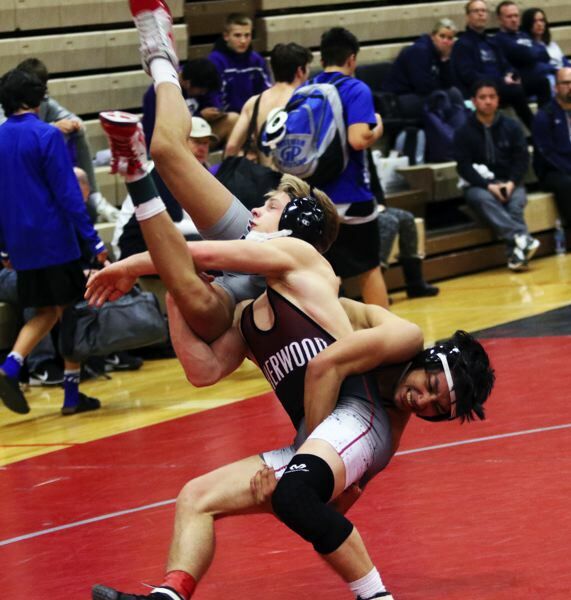 TUALATIN — The Sherwood High School wrestling team has been battling all year. The Bowmen definitely seemed to battle on Saturday. And they came very close to battling their way to a tournament championship. Sherwood, with a strong performance, took second place in the team standings at the Winter Warriors Memorial Invitational, held at Tualatin High School. 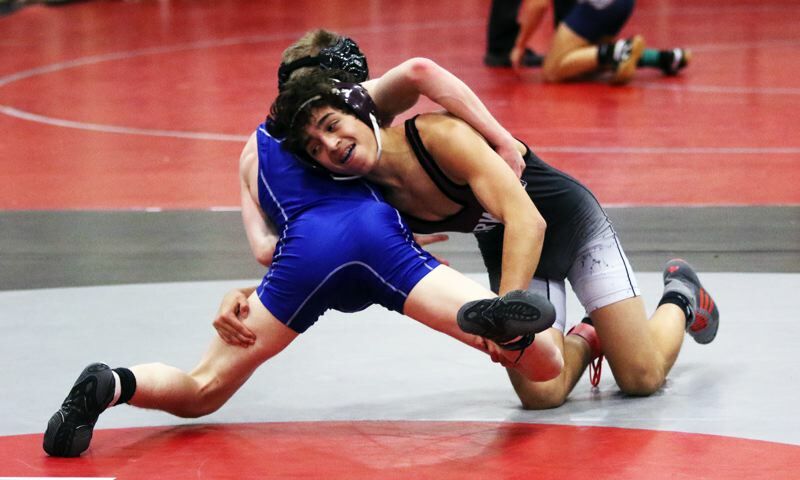 "We probably have the best team that Sherwood's ever had," said Bowmen senior Gaven Jolley, who won a tournament title at 126 pounds on Saturday. "I'm really excited. We've had a lot of young guys in the past, and now we're growing and maturing. It's coming together really well." "It's going great," said Sherwood freshman Ethan Ritchie, who captured tournament gold at 106. "We're having a lot of fun." The Bowmen took second place in the team standings at Saturday's 13-school event with a score of 254.5 points. The host Tualatin team took first place with a score of 275.5. "I'm really impressed with our team," Jolley said. "Everyone is working hard. We're sort of at the tip of the grind right now, and we just have to push through it." For Jolley, who won Class 6A state championships as both a freshman and sophomore, Saturday's tourney title looks to be another step on what Jolley is hoping to be a banner senior season. "My goal is to win my third title, and it's going well," he said. Jolley, after receiving a first-round bye, opened action at Saturday's tournament by pinning Ethan Diatte of Grants Pass in a time of 50 seconds in a quarterfinal match. In the semifinals, Jolley scored a 14-6 major-decision win over Ryan Johnston of Grants Pass. That put Jolley in the 126-pound finals against Isaac Quesada of Wilsonville. Jolley got off to a fast start in that bout, scoring on three first-round takedowns to claim a 6-2 lead. Jolley then had an escape, a takedown and a 3-point nearfall in the second round, as he upped the margin to 12-2. Another takedown in the third round helped Jolley secure a 14-4 major-decision victory. "I didn't really do much on top," Jolley said. "I got him in a cradle, and it definitely was a pin, but the ref didn't call it." Meanwhile, Ritchie was happy with his championship performance at the tourney. "It means a lot," he said. "I worked hard, every day in practice, and it feels good." After receiving a first-round bye, Ritchie opened the tournament by pinning Sunset's Tabor Whitehead in 1:01 in a quarterfinal match. Ritchie then beat Tualatin's Joshua Allen by fall, in 0:29, in the semifinals. That put Ritchie in the 106 title bout against Houston Miner of Grants Pass. In that match, Ritchie took a 2-0 lead with a takedown coming with 1:06 left in the first round. He then scored on a takedown and 3-point nearfall in the second period, giving him a 7-1 lead going into the third round. Ritchie then got another takedown, coming with 1:45 left in the final period, to wrap up the 9-1 major-decision win. "He was tough. It was hard to take him down, but I was able to get a throw and the first two points," Ritchie said. "I was able to get a power-half, and get him to his back. I was happy. It was a good win, but I'm tired at the same time." Sherwood senior Jackson Barton came close to earning a tournament title, as he was edged in overtime to Tualatin senior Gavin Moore in the 220 championship match. Bowmen freshman Seth Glenn was the tourney runner-up at 132 and junior Ian Glenn took second place at 182. Also for the Bowmen, junior Logan Swanson was third at 126, sophomore Bryan Cuthbertson was third at 220, junior Nick Severson was third at 285, freshman Nick Hekker was fourth at 113, junior Philip Resch was fourth at 138, sophomore Malachi Tishendorf was fifth at 145, senior Kaden Rhinehart was fifth at 195, senior Haden Munson was sixth at 120, sophomore Dalen Jolley was sixth at 138, senior Ian Stormont was sixth at 152 and sophomore Ashton Sarono-Ramos was sixth at 160. Prior to the tournament, the Bowmen scored a 58-19 win over Forest Grove in a Pacific Conference dual match held last Thursday at Sherwood High School. With the win, the Bowmen improved to 3-1 in conference matches. Sherwood will be back in action on Thursday, when it travels to face McMinnville in a Pacific Conference match. Varsity bouts are set to start at 7 p.m.